Also a bit of an issue besides it saying BOS, not TB, is that it should say MST, not MDT. Never use *DT* if you aren't in Daylight Saving Time. I've heard of blowing a 28 point lead in the 3rd quarter, but a 31-0 lead? Did the spirit of Frank Reich possess Tom Hudson? Hurry up Bubsy and get that home game Victory Bowl! Oh yeah, and Houston is probably gonna choke, leading to an 8 vs. 10 Victory Bowl. And yet again, our Imperials choke in the postseason. Detroit and Houston both move on? Bobcats over Guardians, got my "G"s mixed up. Two of them. The Miami Suns and the Tampa Bay Bobcats. I recommend reading through the thread. It's long, but it is worth it. The highly-anticipated shootout fell flat, as neither offense played particularly well all day. 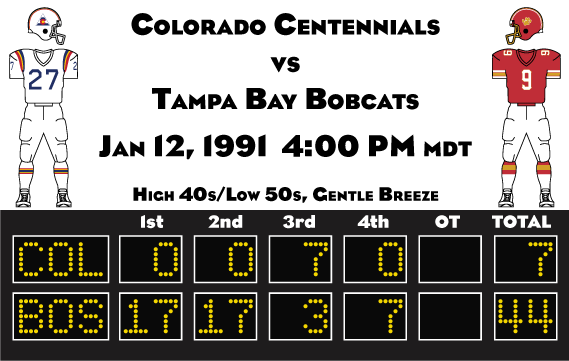 The only points of the first quarter came on a 45-yard field goal by Tampa’s Ken Mattox, and the Bobcats were able to extend the lead to 10 on their next possession when RB Wayne Lee scored a walk-in touchdown after taking the ball to the right side of the defense on a halfback toss. However, after scoring on back-to-back possessions, the Tampa offense fell silent, failing to do so much as record another first down until early in the fourth quarter. Cincinnati finally broke the shutout with 3:06 to play in the first half on a 9-yard pass from Reggie Hart to WR Chris Kramer (who made an impressive catch through blatant defensive pass interference by Tampa CB Hsulu Green). The Bobcats responded with a great kick return which would have allowed them to start in Cincinnati territory, had it not been nullified by a holding penalty. Things went from bad to worse when, on the very next play, DT Andrew Gray flattened QB Bobby Davis, knocking the ball loose at the Tampa 17. Players from both teams dove for the ball, and three times a man was able to get a hand on the ball but not bring it in. However, each time the players dove for it, it was knocked further and further toward the Tampa end zone, until DE Mark Rotermund was able to fall on it for a touchdown, allowing the Guardians to take a 14-10 lead into the locker room. The second half was even more uneventful than the first. Cincinnati went up by 7 on a 29-yard field goal late in the third. 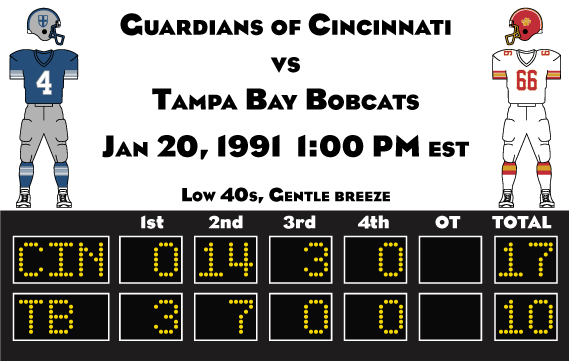 The Bobcats didn’t even advance into Guardian territory until there were less than four minutes remaining in the game, and that drive was brought to an end when Gray managed to get a finger on a pass, deflecting it just enough that SS Dirk Hammen was able to come forward and pick it off. When time expired, Cincinnati’s 17-10 lead held. Both of their playoff victories had been ugly, but style points don’t mean anything in the AFA – the Guardians are headed to their third Victory Bowl since 1985. This matchup on a breezy day in Houston got off to a bad start. Just a few minutes into the game, Boston’s big, physical CB, Barry Koehler threw a late hit on QB Tom Hudson as he slid to the ground. Hudson was slow to get up, and a scrum ensued as the Hurricanes moved to defend their quarterback. Koehler, for his part, experienced more than a few unnecessarily hard blocks as the game wore on. On the brighter side, the game was closely contested throughout the first half. Boston opened the scoring with a 3-yard run by FB Gary Kurrasch 9 minutes into regulation. Ten minutes later, Houston knotted it up at 7 as Hudson found TE Billy Langdon for a 15 yard strike. The Hurricanes quickly forced a 4th down, and the special teams set up the offense with spectacular field position after Brian Montgomery came around the edge and blocked the punt. The offense wasn’t able to move the ball, but James Pickle connected on a 38-yard field goal which would send Houston into the half with a 10-7 lead. The teams traded punts throughout the early part of the third, but with 8:50 remaining in the quarter, Tom Hudson took the ball into the end zone on a four yard bootleg, making it a 10-point game. The remainder of the quarter would be catastrophic for Boston. KR Harlan Morris fumbled on the ensuing kickoff, allowing the Hurricanes to start from the Boston 15. It took less than 90 seconds for RB David Kennedy to score (though Pickle shanked the extra point attempt). After seeing a 13-point swing since their last possession, the Captains offense retook the field, and put together what looked like a strong drive. However, shortly after advancing into enemy territory, QB Jon Cliffe threw the ball behind WR Scott Kimble for an easy interception by CB Michael Divers. A shoestring tackle by RB Russell Fraizer at the Boston 29 stopped Divers from taking it to the house, but this only served to delay the inevitable, as just minutes later, David Kennedy blasted his way into the end zone for the second time of the day, giving Houston a 30-7 lead as the third quarter wound down. The Boston offense was all but useless for the rest of the game, though solid special teams play allowed them to maintain slim hopes for a comeback when Harlan Morris atoned for his earlier fumble with a 79-yard punt return touchdown to make it a 16-point game with just over 9 minutes to play. The team showed some sign of life as the two-minute warning approached, but Cliffe threw another bad interception when LB Steve Kaur jumped the route on a swing pass to Fraizer at the Houston 27. No Captains player could have stopped him from scoring, but he intentionally stepped out of bounds at the Boston 37, allowing the offense to retake the field and run out the clock. The Hurricanes are headed back to the championship, where they will get a shot at revenge against the Guardians in a rematch of the 42nd Victory Bowl. The Hurricanes have been to the Victory Bowl twice before, and lost those two games by a combined total of 94-7. This time, they will not be pushed around so easily. Both teams have a great deal of talent on both sides of the ball, and there are perhaps as many as 8 men who will be enshrined in Richmond someday participating in this game. The difference between the two sides is that Cincinnati’s stars are seeing their careers wind down, while Houston’s are in their prime. Cincinnati’s QB Reggie Hart (33), TE Vic Meredith (33), and DT Andrew Gray (35) are legends, but Houston’s QB Tom Hudson (29), RB David Kennedy (24), WR Mark Ellison (25), LB David Rowe (26), CB Michael Divers (24), and SS Brett Dworakowski (27) are the present and the future. 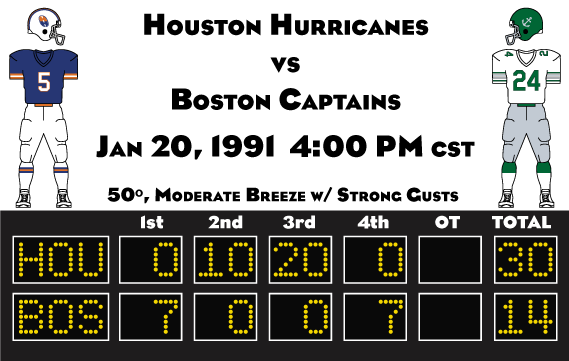 With other top-tier teams in the league aging (Cincinnati, New York, Detroit, and Minnesota in particular), the Hurricanes are poised to be the dynasty that dominates the 1990s. That dynasty starts on February 3rd. Hurricanes get their revenge 31-17. This is Cincinnati’s 7th Victory Bowl appearance. They lost the 1st, 2nd, and 3rd Victory Bowls to the New York Imperials, as well as dropping the 9th to Boston. However, their luck has turned around since then, as they defeated Atlanta in the 40th and Houston in the 42nd. As mentioned, this will be Houston’s third time in the big game. They lost the 31st Victory Bowl to Pittsburgh in a humiliating 50-0 shellacking, and then 11 years later, were crushed in an only slightly less humiliating manner, losing 44-7 to Cincinnati in the 42nd. This gives them the ignominious distinction of having given up both the most and second-most points in Victory Bowl history. The game will take place in sunny Hollywood, Florida, at the two-year old Ryder Stadium, home of the Miami Suns. This is the first time in a decade that the event has been held in South Florida, though this marks the sixth time that the game has been held there, which ties Pasadena for the most frequent host. The field for the 45th Victory Bowl is somewhat unusual. The argyle team boxes are a nod to the retiring Willie Krause. 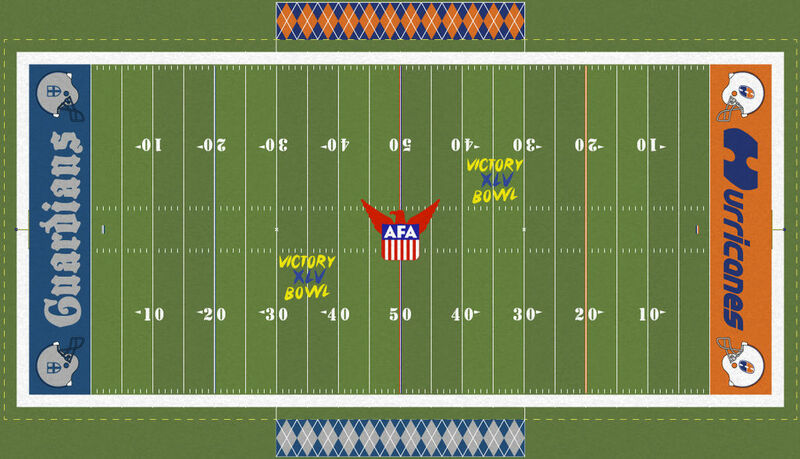 The field contains only a partial Victory Bowl logo, which is essentially because the ground crew ran out of time to do the full logo well. Between the intentionally messy nature of the design, the extra time spent on the team boxes, and an incredibly rainy week leading up to the big game, they decided to go this route instead. I'm a little lost as to your line of thinking there. Reducing the number of divisions from 6 to 5 would necessarily break up more traditional rivalries than adding a fifth team to the Northern and Southern divisions. I mean, the very worst that could happen is that one or two teams are moved around, and even that is pretty unlikely, given that the South already stretches all the way from Florida to Arizona, meaning that they can absorb a franchise just about anywhere in the country. Looking at the USFA cities as the most likely contenders, Brooklyn and San Jose are the only ones that wouldn't fit neatly into one (or both) of the four team divisions. The expansion to 32 teams will create some problems, but there really isn't a way around that. I could either do 8 divisions of 4 or 4 divisions of 8. Both would break up some traditional rivalries, and the latter would require 14 divisional games each season, which isn't going to happen. Adams may come back for one more go, but he looked pretty bad in December and January. He's definitely on the verge of joining former Comet Jack Holmes as best quarterback to fail to earn a ring. He has expressed interest in coaching and/or front office positions, however, so maybe he'll have a chance to earn one (or more) on the sideline or behind the scenes someday. The argyle boxes are a very nice touch, and I'm glad they did those instead of the Victory Bowl logo from a sentimental standpoint. I'm going with Houston to finally get their championship, but it'll be close.